Dental implants are the treatment of choice for people missing one, a few, or all of their teeth, and for those with failing teeth or severe periodontal disease. A dental implant is essentially a titanium substitute for a natural tooth root, rooted in the bone, and implants replace, look and perform like natural teeth. The need for plastic on the roof of the mouth, or adhesives and denture creams is eliminated. More important, the use of dental implants does not impact healthy, adjacent teeth. For eligible patients, replacement teeth then can be restored immediately, returning a spectacular smile in a short time span, usually on the same day. 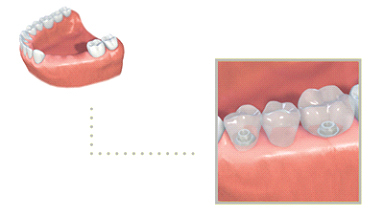 the crown, which is the visible tooth in the mouth, and which fits onto the abutment for a natural appearance. With 50 years of clinical research and an overall success rate of 96%, dental implants are frequently the best treatment option for the replacement of missing teeth. Many people, have lost one or more teeth, the unpleasant consequences may lead to an unattractive smile, embarrassment from loose dentures, pain, difficulty with eating, and a limiting lifestyle. In many situations, a dental implant is the most pleasingly aesthetic solution for replacing the missing tooth, as weel as the most comfortable from a functional perspective. An all-ceramic dental crown or dental bridge, secured to a dental implant, provides a complete and beautiful solution for improving your smile. Dental implants can replace single or multiple teeth, or all the teeth on one or both jaws/arches of your mouth. Implants are fixed in place and do not move, so you don�t experience the same problems as with dentures. Implant supported teeth are the next best thing to natural teeth. They look, feel and function very much like your natural teeth. Dental implants allow you to eat all the foods you like, just as with your natural teeth. Dental implants help encourage the preservation of natural jaw bone and maintain the facial structure. Dental implants have a 95% success rate, supported by many years of clinical experience and many satisfied patients. Dental implants and your new teeth preserve healthy the adjacent teeth from the destruction caused by conventional fixed bridge treatment, which requires filing down of healthy adjacent teeth to support the bridge. These filed down teeth can often fail within just a few years, requiring more extensive and expensive dental work. Dental implants provide a longer-term solution to your dental problems, often lasting a lifetime. Traditional bridges usually require replacement due to the support teeth , which eventually fail. With dental implants, you eliminate the discomfort often associated with ill-fitting dentures. The teeth adjacent to your missing tooth can change position to fill the gap by tilting or over-erupting. The loss of your missing tooth�s root can cause your jawbone to shrink, making your face appear prematurely older. A missing tooth in the front of your mouth affects your smile and self-confidence. It results in difficulty to chew or eat your food which leads to compromising ones life. If you have lost a single tooth due to an accident or from periodontal disease, a dental implant can easily replace the lost tooth. In fact, dental implants have become a treatment of choice for most patients looking to replace a missing tooth. 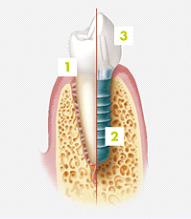 The dental implant replaces the missing tooth root and acts as a support for the implant crown. The healthy adjacent teeth do not have to be filed down and the healthy tooth substance remains intact. Most missing single teeth can be replaced with an implant and a replacement crown on the same day, avoiding the need for a denture or a temporary tooth. 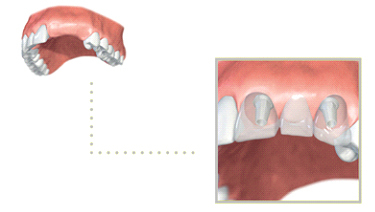 Replacement of an individual tooth in the front region with an implant-supported crown. When a tooth is lost, the bone and tissue shrink away. Teeth preserve bone integrity. The jawbone tends to remain preserved by a dental implant and brings the tooth back into function thus avoiding the bone and tissue loss associated with losing teeth. The spaces between teeth are recreated as normal and oral hygiene such as flossing is maintained. The positive results of an implanted tooth offers a long term solution which lasts a lifetime. 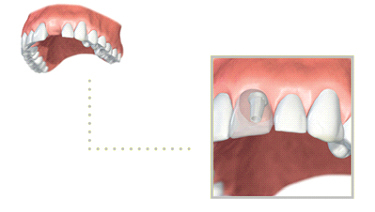 Like single teeth, several missing teeth can be successfully treated with dental implants. 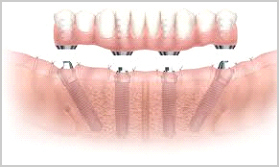 Teeth on implants are permanently fixed in the mouth. Removable appliances, like a denture can slip or click but with implants, there is no worry about teeth moving or falling out is eliminated when eating or speaking. Dental implants look, feel, and function like natural teeth, and can last a lifetime. In addition, they preserve the jawbone which would otherwise resorb and disappear as with dentures. One of the options for replacing multiple missing teeth is a bridge. The adjacent, usually healthy teeth, must be filed down and capped to support the bridge across the space where the teeth are missing. The capped teeth are weakened in the process, and may fail over time, creating further dental problems. The bone in the area of the bridge where the teeth are missing will continue to resorb /deteriorate, and eventually cause further dental problems. Sometimes, the spans requiring replacement teeth are too large for a bridge. The average life expectancy of a bridge is 5-7 years before it requires replacement. In contrast, with dental implants being placed directly into the bone, the healthy neighbouring teeth do not have to be ground down, which helps to improve the long-term prognosis of these teeth. Further loss of bone is also prevented, and can last a lifetime. Another option for replacing multiple missing teeth is a denture. Dentures are appliances made of acrylic plastic and metal that clip to adjacent healthy teeth in order to fill the gaps created by missing teeth. This provides a cosmetic solution, with poor function compared to fixed teeth. Many denture wearers report that they have embarrassing slippages or dropping down of their dentures with visible metal clasps and are reluctant to smile, laugh or even speak in public. Dentures affect the function of eating and reduces social confidence. Patients report discomfort with a foreign bulky object in their mouth. Dental Technology has moved so forward resulting in patients having implants and teeth replaced on the same day. With the option of dental implants they do not move and are fixed to the jawbone and will feel like your natural teeth.They function and are cosmetically pleasing as your natural teeth. . Patients who have had dental implants report what a life changing favourable experience , dental implants have made to their lives.They are able to eat , taste and enjoy food and feel better as a result of having more confidence. Dentures are unstable and slip and move. Usually this can be improved by the use of denture fixatives. Dentures can make eating very uncomfortable/painful, and a change of diet is usually required due to the fact that dentures only provide as little as 20% of the function of natural teeth. Many denture wearers report a lack of confidence because of their dentures, usually caused by embarrassing slipping/dropout. The upper denture needs to cover the palate, greatly reducing the ability to enjoy food. Most importantly, bone loss continues often resulting in an exaggerated aged appearance in patients with conventional dentures. They can be used to retain your dentures more confidently, or they can be used to replace all your teeth with a fixed bridge. Implant dentistry offers removable prostheses and non-removable rows of teeth to restore completely toothless jaws. Prostheses on implants offer secure hold in any situation. The chewing forces are transmitted to the bone. This prevents bone atrophy and thus ensures optimal prosthesis fit in the long term. The palate remains free from prosthesis material. The sense of taste and thus enjoyment of eating are not impaired. Dental implant-supported teeth restore function almost the same level as natural teeth. We recommend the All-on-4 Procedure as the most reliable, efficient, and cost-effective approach. 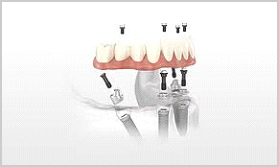 What�s really great is that a full set of implants and teeth can be replaced on the same day. The treatment process for implants is more time consuming requiring complicated treatment and several different dentists over a few months. 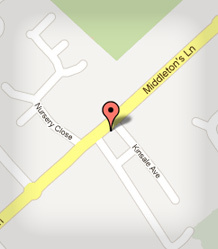 At Hellesdon Dental Care, patients who qualify are able to have their implants and their teeth on the same day. This is possible through thorough extensive treatment planning and the use of CAMCAD computer aided planning with surgery whilst using h the use the latest in Immediate Function clinical techniques and protocols. The All-on-4 treatment concept was developed to provide edentulous patients ( patients with no teeth of their own ) with an efficient and effective restoration using only four implants to support an immediately loaded full-arch prosthesis.